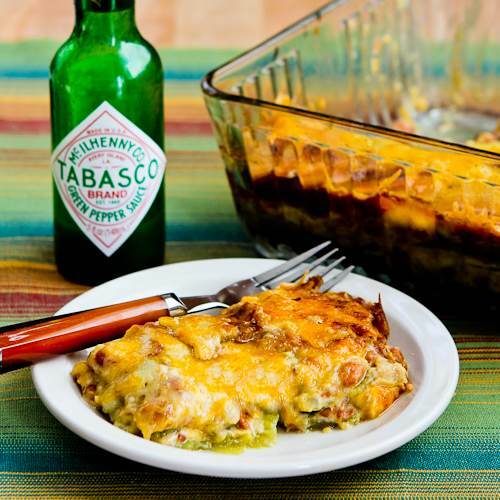 This Vegetarian Green Chile and Pinto Bean Layered Mexican Casserole is a perfect Meatless Monday dish that’s also gluten-free, low-glycemic, and South Beach Diet friendly. Use the Recipes-by-Diet-Type Index to find more recipes like this one. Click here to PIN this tasty vegetarian casserole so you can make it later! 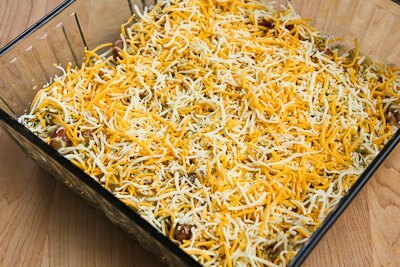 This Vegetarian Green Chile and Pinto Bean Layered Mexican Casserole is a new recipe and it’s the firstborn child of my Green Chile Mexican Casserole with Ground Beef and Layered Mexican Casserole with Chicken. Once Jake and I had the idea of trying to create a vegetarian casserole with some of those same flavors, it took us three tries to get it right. But this final version is a definite winner, with all the flavors that make bean and green chile burritos such a favorite of many people. Even though casseroles aren’t too photogenic, I love them for the way the flavors combine to make a sum that’s greater than the parts, and a leftover casserole like this in the fridge is always a nice benefit. And of course, this is my Meatless Monday dish for this week, and I’m betting the whole family will like this one. (You can find more meatless recipes by using the label Meatless Monday or checking Vegetarian Recipes in the recipe index. For more Meatless Monday ideas from other bloggers, follow our Meatless Monday board on Pinterest. Drain the pinto beans into a colander and rinse with cold water. 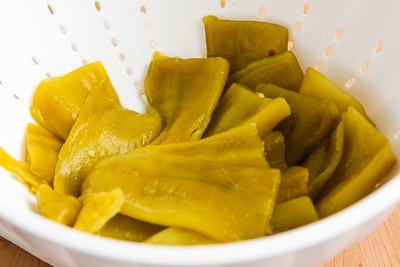 In a different colander, drain the whole green chiles. 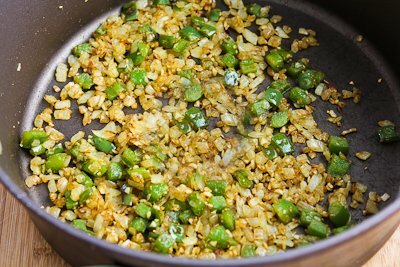 Heat the oil in a large pan, then saute onions, green peppers, minced garlic, and ground cumin. Season with a little salt. Add the drained pinto beans, cook about 3-4 minutes, then mash slightly. Add the green chile enchilada sauce and cook until it’s mostly absorbed by the beans, then turn off heat and stir in the sour cream. 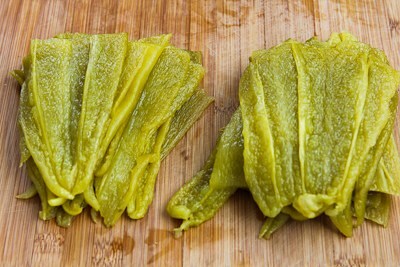 One at a time, open the whole chiles with your fingers and wipe with paper towels to dry them and remove seeds. Make into two stacks. 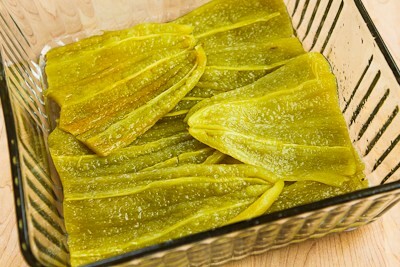 Spray the casserole dish with non-stick spray and make a layer of half the green chiles. Then make a layer with half the bean mixture. Followed by a layer with half the cheese. 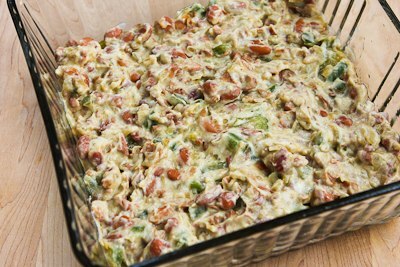 Make another layer each of whole green chiles, bean mixture, and cheese. Bake with the lid on or covered with foil at 375F/190C for about 30 minutes. Serve hot. I would love Spicy Mexican Slaw as a side dish for this! 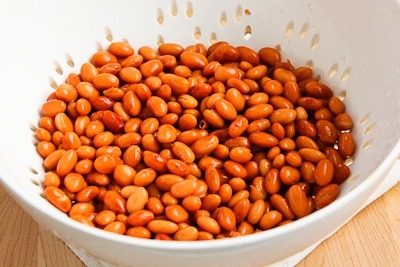 Drain the pinto beans into a colander, spray with cold water until no more foam appears, and let beans drain. In another colander drain the whole green chiles. Heat the olive oil in a large frying pan over medium heat. Add the onions and peppers and saute 4-5 minutes, until they are just starting to brown. Add garlic, cumin, and salt and cook another minute or two, then add the drained beans and cook 3-4 minute, then mash the beans slightly. (We used a potato masher, but you can use a large fork.) Add the cup of green chile enchilada sauce and simmer until the sauce is mostly absorbed by the beans. Then turn off the heat and stir in the sour cream. While the bean mixture is cooking, open the whole chiles with your fingers and wipe with paper towels to dry them and remove seeds. (This will take about 10 paper towels, but don’t skip this step.) Divide the chiles into two stacks. 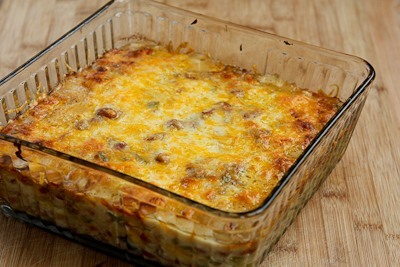 In the casserole dish make a layer with half the whole green chiles, half the bean mixture, and half the cheese. 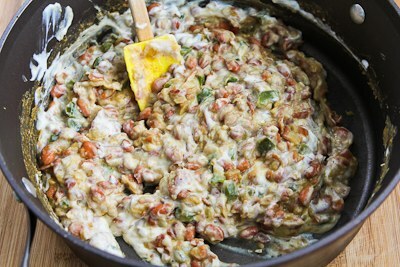 Follow with another layer each of whole green chiles, bean mixture and cheese. 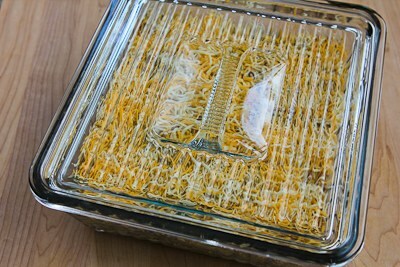 Cover the casserole with the lid or with foil and bake about 30 minutes, or until cheese is all melted. Remove the lid and bake about 20 minutes more, until casserole is bubbling and starting to brown on top. (You can put it under the broiler for a few minutes if it seems done but you’d like the cheese more brown.) 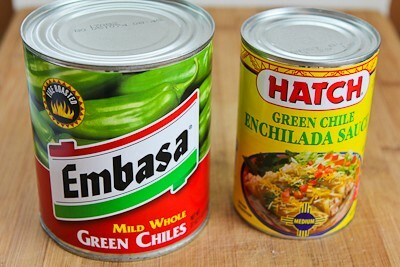 Serve hot, with condiments like salsa, Green Tabasco Sauce, sour cream, or guacamole if desired. This will keep in the refrigerator for several days and also freezes well. This casserole has dried beans, which are probably too high in carbs for strict low-carb diet plans. It’s a low-glycemic recipe, suitable for all phases of the South Beach Diet, but serving size for beans is limited for South Beach Phase One. Be sure not to eat more than the 1/8 casserole serving size if you’re actively trying to lose weight on Phase One. Have you tried to freeze this recipe and make at a later time? It sound delish! I haven’t ever done that. I think I’d be more likely to cook it and freeze leftovers. But would love to hear how it works if you try it. This was terrific! Liked by the entire family. Thanks Lisa; so glad it was a hit! peno hot sauce. My husband went for seconds.. unusual on meatless monday lol Thanks for all you do Kalyin.. you are me new "go to" for just about every thing I make! I'm so glad you posted this. I was looking for a yummy Mexican themed casserole for a barbecue on Saturday. This looks like just the thing! This sounds fantastic! 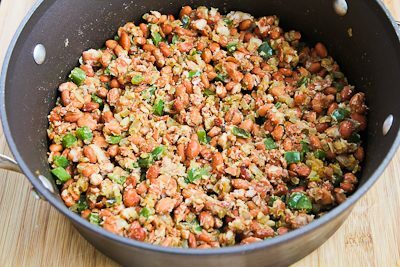 I just made a big batch of pinto beans and am looking for ways to use them up. Made this tonight for dinner — what delicious comfort food! Thanks for the recipe! Kalyn, I really loved this casserole. I too had trouble finding whole green chills, even at a Mexican market. Finally found them at Meijer. For our taste, it needed more spice, so we just added at the table. Maybe the next time I make it I might incorporate more spice into the casserole itself. I made this the other night, but added chicken(more protein)I loved it and my husband was licking his plate! We had a lot left over, since we both have just had weight loss surgery.I will definitly make it again, but freeze or make half of the recipe. This is making me hungry! Something about winter makes me crave casseroles. I'm so excited to try this tonight! Thanks for the recipe!! 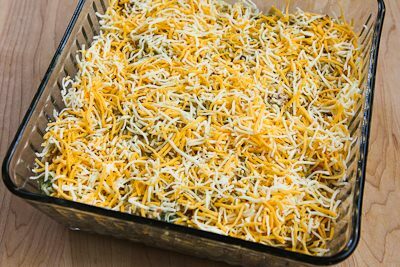 I love a good casserole and especially one with all of these great Mexican flavors! Lydia if you like bean and green chile burritos, you'll love this! Yes, please. I bought one of these casserole dishes, on your recommendation, and I've been playing around with all sorts of bean, cheese and chile casseroles. Can't wait to try this one.